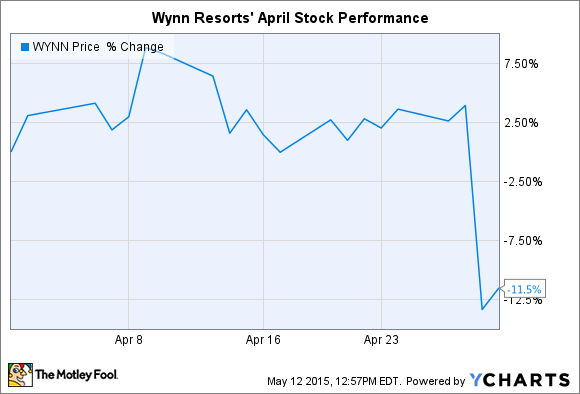 What: Wynn Resorts (NASDAQ:WYNN) stock dropped 12% during the month of April, according to S&P Capital IQ data. So what: Shares fell after the gaming company posted first-quarter earnings results late in the month. That announcement included lower-than-expected revenue and profit figures, along with a big cut in the dividend payout. Overall sales fell 30% due to weakness in the Macau casino business. That division posted a 38% decline as lower gambling traffic hurt results. Wynn's Las Vegas operations, by contrast, grew marginally in the quarter. Meanwhile, Wynn Resorts' dividend was slashed to $0.50 per share from the $1.50 per share the company paid out in the prior quarter. Now what: Management decided to cut the dividend as a response to the soft global operating environment that is soaking up a greater share of earnings. In a conference call with analysts, CEO Steve Wynn said that the company did not want to "issue dividends on borrowed money." Still, executives left the door open for a potential raise in the future. Wynn noted that management "would not hesitate to adjust the dividend down or up based upon performance without a second thought and without any apology." It's not possible to predict when a rebound allowing a dividend raise might happen. So the company plans to focus on improving the experience of its resort guests in the meantime. Investors can also look forward to the approaching launch of its hugely ambitious $4 billion Wynn Palace, which is slated to open in Macau sometime in the first quarter of next year.